Everyone compares Divergent to The Hunger Games—and I do so love The Hunger Games—so I decided to give it a go. The Hunger Games comparisons are apt. Like The Hunger Games, Divergent is a dystopian/post-apocalyptic YA trilogy with a little romance and a little violence (well, maybe more than a little violence). Amity: They seek to eradicate aggression and value peace and friendliness above all else. They dress in bright, happy shades of red and yellow. They are counselors, caretakers, and artists, and they are responsible for farming and providing food to the other factions. Candor: They seek to eradicate duplicity and value honesty above all else. The faction “sees the truth as black and white, so that is what they wear.” They are in charge of the law. Dauntless: They seek to eradicate cowardice and value bravery above all else. They dress all in black and are covered in piercings and tattoos. They are known for acting recklessly (they are the only faction that rides the El, which never stops—they simply hurl themselves on and off the trains). They are responsible for the city’s security. Erudite: They seek to eradicate ignorance and value intelligence above all else. They must wear at least one article of blue clothing at all times, “because blue causes the body to release calming chemicals, and ‘a calm mind is a clear mind.’” They are the city’s teachers and researchers. Kids from all factions attend school together. They follow their parents’ faction’s guiding principle, but, as children, they are not yet members of a faction. At 16, each kid is given an aptitude test at school. The test involves a simulation that determines the kid’s predisposition for a certain faction. Following the test, the students participate in the Choosing Ceremony, where they pick the factions they wish to join. Many kids remain in the faction in which they grew up, but others choose a different faction. They are called transfers. 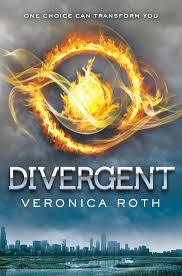 Divergent follows Beatrice Prior, who grew up in Abnegation. If you watched the trailer above, then you already know that the aptitude test didn’t work on Beatrice–it was inconclusive. She could not be pigeonholed into one faction’s belief system. The only factions that could be ruled out are Amity and Candor. She is, therefore, considered Divergent. Divergence is believed to be dangerous, because those who are Divergent cannot be controlled. Beatrice is cautioned by her test administrator to keep her Divergence a secret. At the Choosing Ceremony, Beatrice chooses Dauntless and must leave her family (“Faction before blood.”). She changes her name to Tris as she begins her Dauntless training, where initiates are challenged both physically and mentally, forcing them to be courageous and brave in the face of their greatest fears. She and other initiates (Dauntless-born and other transfers like Tris) are battling it out for 10 member spots in Dauntless; the rest of the initiates will become factionless. When Beatrice begins her training, the factions are at peace . . . but not for long. If I weren’t using The Hunger Games as a benchmark, I would have given this a higher rating. But it’s impossible not to compare the two (same genre, same audience, similar protagonist, even some similar plot points) . . . and, by comparison, it’s not as good. I didn’t like or care about the Divergent characters as much as The Hunger Games characters (Beatrice is fine, but let’s face it: Katniss is a badass). The Dauntless initiation was fun and exciting . . . but definitely not as fun and exciting as the Hunger Games. And the romantic aspect of Divergent is not as complicated (and, thus, not as interesting) as the Katniss-Peeta-Gale love triangle. All that said, I don’t want to sell this book short. I enjoyed it. It is definitely a page-turner. There’s a lot of action. The faction thing is a fun idea (similar to but far more developed than the Districts in The Hunger Games), despite some inconsistencies. The made-up, future-y stuff is great—l really enjoyed the simulations Beatrice goes through (both the aptitude test and the fear simulations that Dauntless initiates are forced to endure as part of their training). The book as a whole is fun and quick and easy. Great fluff. My biggest gripe with the book is that it simply isn’t a good stand-alone book. It obviously isn’t meant to be read by itself. It ends abruptly, in the middle of the action, forcing you (if you care enough) to read the next book to see what happens. I recognize that this is part of a trilogy, but each book should be its own story with a beginning, middle, and end. Who should read it: John and Lindsay (i.e., people who liked the action and pace of The Hunger Games trilogy). Also, if you found the trailer for the movie at all interesting, you’d be into the book. Looking for a last-minute Christmas present? The Divergent trilogy boxed set would be a fun choice. What did YOU think? This is one that I’m sure a lot of you have read, so I’d love to hear your thoughts! This entry was posted in Rating: 3.5/5 and tagged Abnegation, Book review, Books, Dauntless, Divergent, Factions, The Hunger Games, Tris, Veronica Roth. Bookmark the permalink. Haven’t read it – yet – but the Choosing Ceremony you describe reminds me of Harry Potter and the Sorting Hat. I honestly think the movie will be better than the book. There are a lot of scenes that could have been easily cut without affecting anything. I’m kind of bugged too by the fact that they don’t seem like standalone books, but more like parts of a single book. I agree that the movie has potential to be better than the book. The book lends itself to the big screen (good action sequences, fun imagery, etc. ), and the trailer looks pretty good. I’m looking forward to it.